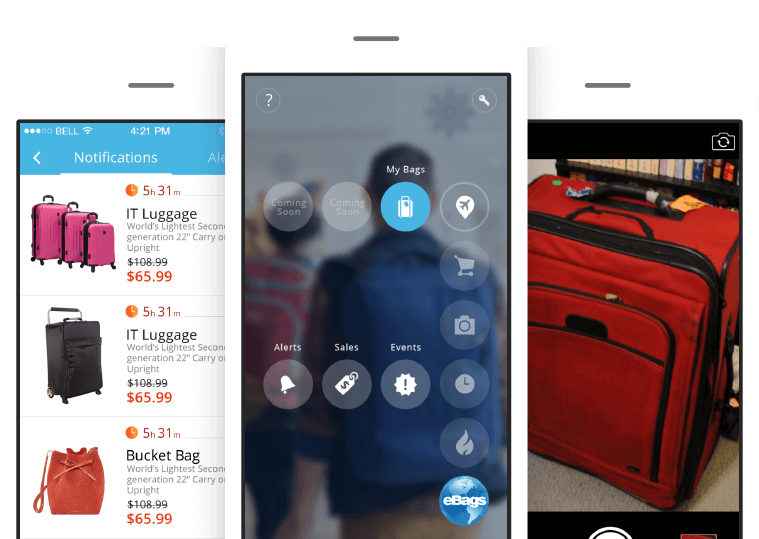 eBags is a mobile application designed to provide a mobile shopping experience for eBags (largest bags retailer in the world) customers. The app features cool visual product search algorythms to match products by pictures taken by customers of similar products they have seen elsewhere (on the street, online etc.) The app also serves as a mobile interface to eBags inventory shopping. Customers can also benefit from easy use push notifications designed for discounted shopping based on different sales events. Connected Tags phase needed 2,2 months to be implemented . One of the major stumbling blocks has been UI. The design was made mostly by a web expert from the client’s side. Our job was to make it adapted to mobile with a tight schedule that the eBags team dictated. We have made a custom menu widget. The main challenge was to make the blur for background image work fast and correctly for all SoC architectures. Working with the eBags app backend, we used Go language for push notifications dispatching. Complex system of notifications required specific server configuration. Go technology allows to create cross-platform scalable solution that can be easily integrated into existing eBags infrastructure. The customer planned to carry out a paid advertising campaign, so we connected Appsflyer to assess the effectiveness of the campaign. This tool allows connecting product application activity (including committed purchases) with the method of installation of the application (the user can find the app in the AppStore or follow the ad campaign link). During the development process, we were using Parse for sending notifications, but it closed soon, so we had to look for an alternative. The full technology bundle: PCSSO API, Android SDK, eBags API, iOS SDK. The first phase was launched on March 4, and the Connected tags was released on August 20. After almost 8 months, eBags app was installed more than 40k times. To make the app work even smoother, after eBags v1.0, we have launched the 1.5 version with some improvements. There was a feature in the app, setting notifications by interested types or brands of goods, but it wasn't used much. That's why we decided to add default notifications. Now, users get "Steal of the day" notifications about featured steals.